An estimated 77 million Americans have a debt that has been turned over to a private collection agency. Thousands of these debtors are arrested and jailed each year because they owe money. Millions more are threatened with jail. The debts owed can be as small as a few dollars, and they can involve every kind of consumer debt, from car payments to utility bills to student loans to medical fees. These trends devastate communities across the country as unmanageable debt and household financial crisis become ubiquitous, and they impact Black and Latino communities most harshly due to longstanding racial and ethnic gaps in poverty and wealth. Debtors’ prisons were abolished by Congress in 1833 and are thought to be a relic of the Dickensian past. In reality, private debt collectors — empowered by the courts and prosecutors’ offices — are using the criminal justice system to punish debtors and terrorize them into paying, even when a debt is in dispute or when the debtor has no ability to pay. As we dust off the adjective “Dickensian,” we might recall that it was on this date in 1811, five days after the birth of the movement in Nottingham, that Luddites smashed over 100 machines intended to eliminate their textile industry jobs in Sutton-in-Ashfield, Kirby, Woodborough, Lambley, Bulwell, & Ilkeston in Derbyshire. 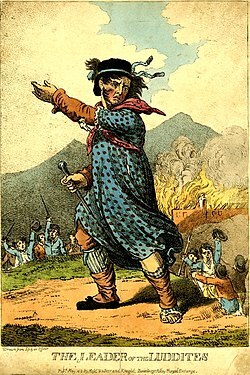 an 1812 illustration of “Ned Ludd,” a fictional apprentice who (per his legend) destroyed two weaving frames in 1779.